The Swedish thriller novel trilogy of The Girl With The Dragon Tattoo, The Girl Who Played With Fire and The Girl Who Kicked The Hornet's Nest, was written by Stieg Larsson. However, his untimely death preceded the global explosion of this trilogy's success, also leading to these wonderfully gripping movie versions. The male lead is Mikael Blomkvist, a journalist writing for the investigative Millennium Magazine, exposing all sorts of corruption and shady acts. One such article gets him in trouble when he seems to be framed with misinformation in the accusations of an illegal arms dealer. With a jail sentence pending, Blomkvist is approached by an aged man to get to the bottom of the disappearance of a niece from the family villa on an island many decades back. But he becomes entangled in a highly dangerous situation. 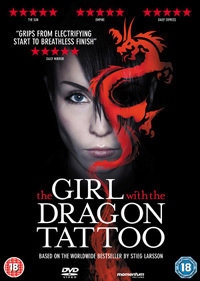 Blomkvist's female counterpart and the main force of this series is the angry, alternative hacker Lisbeth Salander, with a huge dragon tattoo on her back. She assists Blomkvist remotely, but her help eventually transcends cyberspace and she tackles this case with him, exposing some very nasty secrets. With her small frame, Lisbeth is hardly a weakling, but her dark past comes to the fore after a violent incident with the corrupt legal guardian restricting her on almost every level. All of the actors involved deliver fantastic believable performances. Intriguing, engaging, tense, shocking and one hell of a movie setting the stage for an amazing trilogy which has won awards like the BAFTA for Best Foreign Picture. DVD extras include enlightening interviews with star Noomi Rapace and producer Soren Srærmose, a photo gallery, and family tree of the characters at the root of the missing girl.